Nils graduated from The Cooper Union School of Art in 1994, and earned an MFA from Hunter College in 2007. Soon after graduating from Cooper, Nils helped establish a school in Nicaragua called Taller Xuchialt, that today enrolls 120 students. He has taught at the Henry Street Settlement and in the public school program Studio in a School. Today he operates a sculpture studio in Crown Heights, Brooklyn. His sculptures and installations have been exhibited in numerous solo and group shows, including at the Robert Miller Gallery, Phillips de Pury, and the University of Georgia, Athens. He has several public works including a large-scale stainless steel sculpture in Ilford England, and another work permanently installed in Hamburg Germany. Nils is also active as a commercial real estate broker. His company, Torus CRE, works primarily with creative and industrial businesses in NYC. 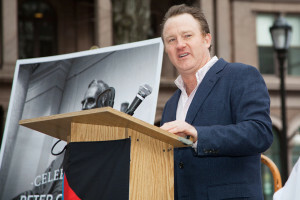 In 2013, Nils helped conceive and lead the Free Since 1859 campaign, aimed at raising money for Cooper Union while sending a clear message of support for the policy of merit based, full tuition scholarships for all students. In just over one month the campaign raised $160,000, attracting the support of a significant number of first time donors. As president of the CUAA from mid-2015 to mid-2017, Nils worked tirelessly to bring stability and inclusiveness to the organization, and to rebuild a trusting relationship with a new administration. As a Trustee on the Board during that time, he was an unwavering advocate for the return to free, emphasizing the importance of alumni as an integral part of any solution. He continues this important work as Chair of a task force revisiting the Memorandum of Agreement (MOA) which formally outlines the relationship of the CUAA with the School. At a pivotal moment of transition for Cooper Union, Nils Folke Anderson provided leadership to our community that demonstrated how positive energy through generosity, listening, respectful dialogue, and mutual trust can set us solidly back on a path towards free education. Nils Folke Anderson was selected Alumnus of the Year in 2018. This entry was tagged Alumnus of the Year, Nils Folke Anderson. Bookmark the permalink.